.32 ACP (Automatic Colt Pistol), also known as the .32 Automatic, is a centerfire pistol cartridge. It is a semi-rimmed, straight-walled cartridge developed by firearms designer John Browning, initially for use in the FN M1900 semi-automatic pistol. It was introduced in 1899 by Fabrique Nationale, and is also known as the 7.65×17mmSR Browning or 7.65 mm Browning Short. .32 ACP rounds. Left: standard FMJ. Right: military FMJ with nickel coating. When the .32 ACP cartridge was introduced, it was immediately popular and was available in several blowback automatic pistols of the day, including the Colt Model 1903 Pocket Hammerless, the Savage Model 1907 Automatic Pistol, the Ruby pistol and the Browning Model 1910 Automatic Pistol to name a few. The popularity of the .32 ACP in the early half of the 20th century cannot be overstated—especially in Europe. Firearms expert Geoffrey Boothroyd of the UK informed author Ian Fleming, his countryman, that James Bond's side arm should be a Walther PPK chambered in .32 ACP. A significant factor in recommending this round was its near universal availability throughout the world in the 1950s. The .32 ACP has been chambered in more handguns than any other cartridge. Between 1899 and 1909, Fabrique Nationale produced 500,000 guns chambered for .32 ACP. Adolf Hitler was believed to have committed suicide with his personal .32 ACP Walther PPK, by aiming it at his right temple and pulling the trigger while simultaneously biting down on a cyanide capsule. Heckler & Koch produced the HK 4, their first handgun, in 1967. Twelve thousand HK 4 pistols were produced in .32 ACP for the German police and other government agencies. The .32 ACP was intended for blowback semi-automatic pistols which lacked a breech locking mechanism. It was John Pedersen with the Remington Model 51 that delivered a true locked breech for the .32 ACP cartridge. The relatively low power and light bullet of the cartridge allowed Browning to incorporate a practical blowback mechanism in a small Pocket Size Pistol. It is still used today primarily in compact, inexpensive pistols, unless the pistol is used for ISSF competition where the cost then escalates. Cartridges in .32 ACP are also sometimes used in caliber conversion sleeves, also known as supplemental chambers, for providing an alternative pistol caliber carbine function in .30-caliber hunting and service rifles. Some comparison of the ".32 Automatic" as defined by SAAMI and the "7.65 Browning" as defined by CIP may be useful. Although some of the cartridge measurements differ by as much as 0.16mm, the names are considered to be synonymous. However, the maximum average pressure - as measured by a transducer on the test barrel - is 20,500 psi (1,410 bar) according to SAAMI, while CIP allows up to 1,600 bar (23,000 psi). This may explain why the cartridges from European manufacturers tend to chronograph at higher muzzle velocities compared to those from American manufacturers. The .32 ACP is compact and light. While some believe it has marginal stopping power, it has been used effectively by military and police worldwide for the past century. Although .32 ACP handguns were traditionally made of steel, they have been produced in light weight polymers since the 1990s. Their light weight, very low recoil and very good accuracy relative to larger caliber pistols make them suitable for concealed carry use. Some popular pistols chambered in .32 ACP are the Walther PP and the Walther PPK as well as the FEG PA-63, which is a clone of the Walther PP. It offers more velocity and energy than the .32 S&W, which was a popular round for pocket defensive revolvers at the time of the .32 ACP's development. Although of lighter bullet weight, the .32 ACP also compares favorably to the .32 S&W Long in performance. Some European 73 grain .32 ACP loads provide similar performance to the .32 H&R Magnum 77 grain lead flat point and 90 grain lead semiwadcutter. The .32 ACP is one of the most common calibers used in veterinary "humane killers", such as the Greener Humane Killer. Given that a .22 LR can penetrate bone, the higher power .32 ACP can easily penetrate an animal skull with a muzzle-contact shot. As a result, the round is suited this purpose, even for fully grown horses and bulls. In Europe, where the round is commonly known as the 7.65 mm Browning, the .32 ACP has always been more widely accepted than it has in America, having a long history of use by civilians and police/security forces, along with limited issue by the military forces. During the second half of the 20th century, several European countries developed firearms for police chambered in 9×18mm Makarov while chambering the same pistol for civilians in .32 ACP and .380 ACP. Examples include the Vz. 82/CZ-83 from Czechoslovakia, FEG PA-63/AP 765 from Hungary, SIG Sauer P230 from Switzerland, and P-83 Wanad from Poland. Today the cartridge has an increased popularity in the United States due to modern compact concealed carry pistols chambered for it, such as the Kel-Tec P-32, Beretta Tomcat, Seecamp LWS 32 and North American Arms Guardian .32. This increase in popularity has led many ammunition manufacturers to develop new loads for the cartridge to increase performance. However, these subcompact guns typically have barrel lengths around 2.5". The traditional steel guns chambered for .32 ACP have barrel lengths around 3.5". Different barrel lengths can have a significant effect on bullet performance with longer barrels providing higher muzzle velocity and energy. 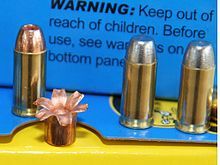 For example, a Cor-Bon 60 grain .32 ACP JHP has 130 foot pounds of energy when fired out of a 2.5" barrel and 165 foot pounds of energy when fired out of a 3.5" barrel. The shorter barrel length can also reduce the range of a bullet. ^ The FÉG AP 765 is a variant of the FÉG PA-63. ^ a b c "32 Auto 60gr Fiocchi JHP". Archived from the original on 2015-01-21. Retrieved September 29, 2014. ^ a b c "Federal Cartridge Co. ballistics page". Archived from the original on 2007-09-22. Retrieved 2007-02-14. ^ a b c "Geco 7.65 Browning/.32 ACP". Retrieved June 23, 2016. ^ a b c "Sellier & Bellot Pistol and Revolver Cartridges". Retrieved October 22, 2015. ^ a b Barnes, Frank C. (2006) . Skinner, Stan (ed.). Cartridges of the World (11th ed.). Iola, WI, USA: Gun Digest Books. p. 289. ISBN 0-89689-297-2. ^ Ian Fleming (March 19, 1962). "The Guns Of James Bond". Sports Illustrated. Archived from the original on 2013-10-05. Retrieved 2013-10-03. ^ Woodard, W. Todd. Shooter's Bible Guide to Cartridges, New York: Skyhorse, 2011. ^ Hornady (2003). Hornady Handbook of Cartridge Reloading. vol I (6th ed.). Grand Island, NE, USA: Hornady Mfg Co. p. 710. ^ "Ballistics by the Inch .32 ACP Results". Retrieved 2013-10-03. ^ "Beretta Web". Retrieved 2013-09-30. ^ "Beretta Web". Retrieved 2015-09-09. ^ "Webley & Scott M1905-M1908". Retrieved 2013-09-30.